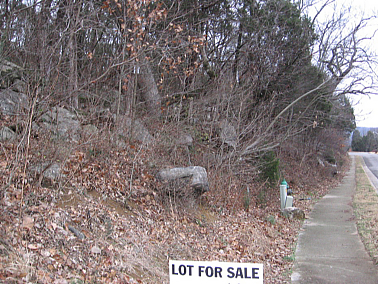 Hillside lots should be considered with great caution. Site prep costs can be enormous. Sloped, wooded, rocky lots like this one present the greatest challenge. I’m not saying that you should rule out this type of site, because houses are built on lots like these all the time. But know that you can easily spend tens of thousands just to get the site ready for a foundation. And it can be very difficult to estimate the cost accurately in advance. You may encounter rock below ground level that will have to be dug out or conceivably even blasted. Any estimate you receive from an excavation contractor will almost certainly contain a “rock clause” meant to cover expense from unseen rock, or rock that must be blasted. If there are other houses nearby, built on lots with similar conditions to the site you are considering, talk to the owners of those houses to get an idea of what their prep costs were. Then get an estimate from an excavation contractor before you buy the land.